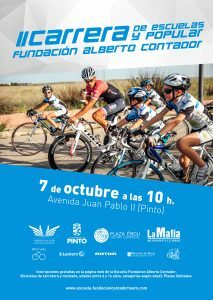 After the success of its first experience, this coming October 7 returns to the Carrera de Escuelas de la Fundación Alberto Contador. A second edition that repeats day, the first Sunday of the month, in a bet to become a fundamental appointment within the calendar of the competitions destined to the categories of base of this sport. 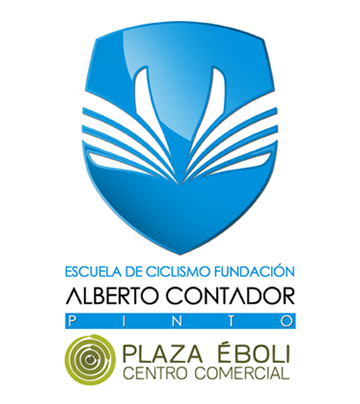 All a party of the formative cycling that would be impossible without the collaboration of the city council of Pinto, the Commercial Center Plaza Eboli, the company of restaurants La Mafia se sienta a la mesa, the supermarkets E.Leclerc, the Hotel Princesa de Éboli, La Capilla restaurant y Rotor Bike Components. The event, which will close the Madrid calendar of en route appointments for schools this season, will have its epicentre in a 1.7 kilometre circuit in the heart of the Tenería de Pinto neighbourhood, specifically in its Avenida Juan Pablo II. A layout designed for the enjoyment not only of all participants federated, but also those kids who want to experience in their own flesh what the competition is. 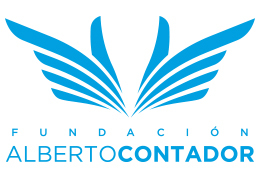 Parallel to the federated races, and taking advantage of the dead time between the different categories, the Alberto Contador Foundation is promoting a popular race, free and aimed at both road bikes and mountain bikes, whose registration can be formalized through its website. It is a different registration to those of school competitions, managed in this case by the Federation of Madrid. This popular race is a novel and interesting way of presenting and promoting cycling as a sport to children who are not used to racing. In 2017, in its first year, the Foundation’s Schools Race attracted more than 300 participants in its different categories. Félix García Casas, sports manager of the Foundation: “This is one of the most important events of our year, all the more so because of our commitment to the promotion of this sport. Every school in Madrid has its own career and, from that point of view, we couldn’t be less. The first edition was a success, with a circuit that was attractive for the participants, with a gift bag with gifts for each child, with the presence of Alberto at the awards ceremony … The participation was a record and even schools came from Valencia, Asturias, Cantabria, Castilla y León, all Madrid … It was a real party and people were very happy. Looking forward to this year we will try to maintain that level of organization and attention to children, so that everyone feels that affection that we put to this test that makes us so excited”.